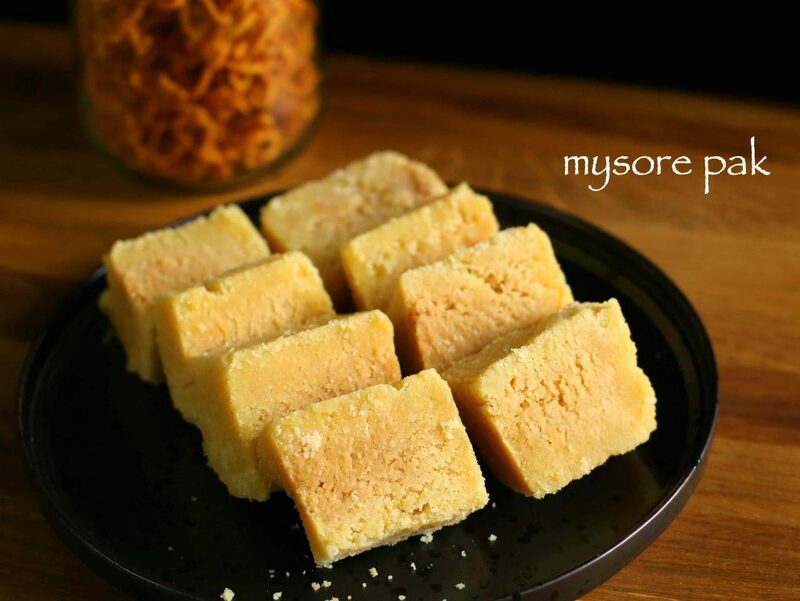 mysore pak recipe | easy homemade mysore pak recipe with detailed photo and video recipe. basically a sweet dish prepared from chickpea flour and melted ghee. a very simple recipe by ingredients yet complicated recipe with the procedure and executions. 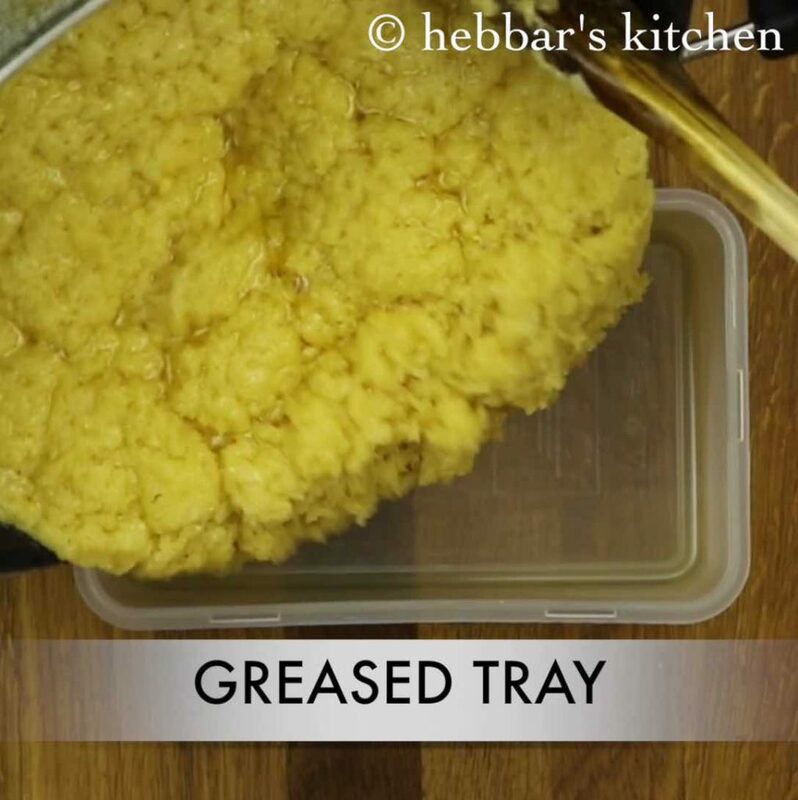 this is very similar to soft mysore pak recipe, which contains only ghee but in this recipe it is mixture of ghee and oil. the history of mysore pak recipe is very interesting and it started in the royal kitchen of mysore palace. initially, the recipe was introduced by royal kitchen chef kakasura madappa when he was asked by the king to prepare a unique and different dessert. basically he prepared by fabrication of gram flour, sugar syrup and ghee and oil mixture. 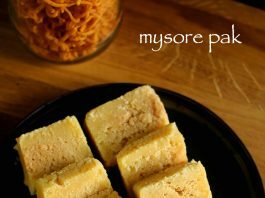 when presented to the this recipe to king, he liked it so much and he named it as mysore pak. pak or literally meaning ‘paka’ in kannada meaning to sweet syrup. even today mysore pak is prepared with the same technique and procedure in the royal kitchen of mysore. 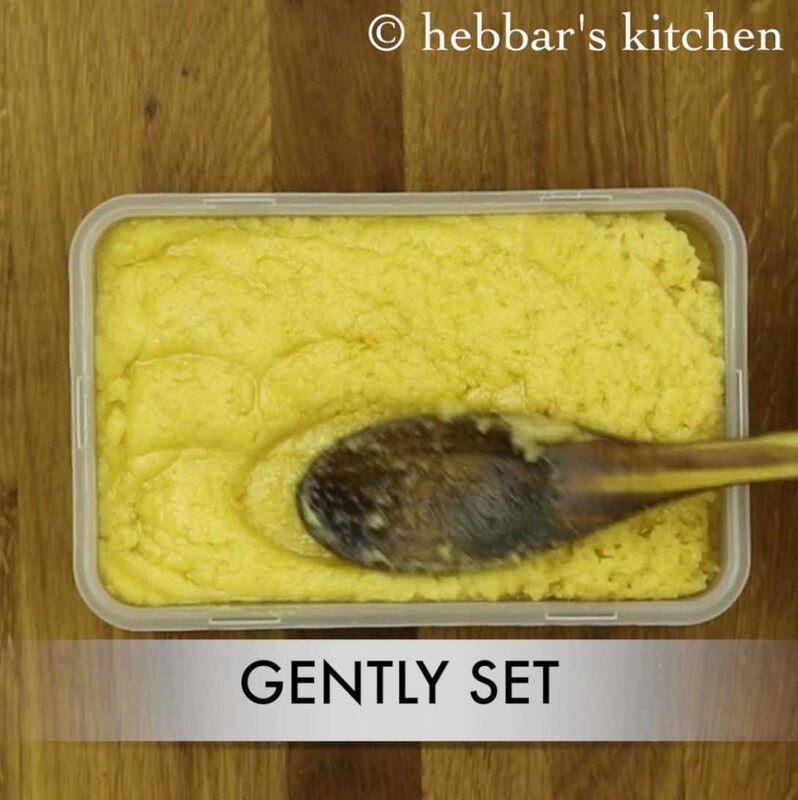 even though the mysore pak recipe is prepared with just 4 ingredients, it has to be prepared with extreme care. 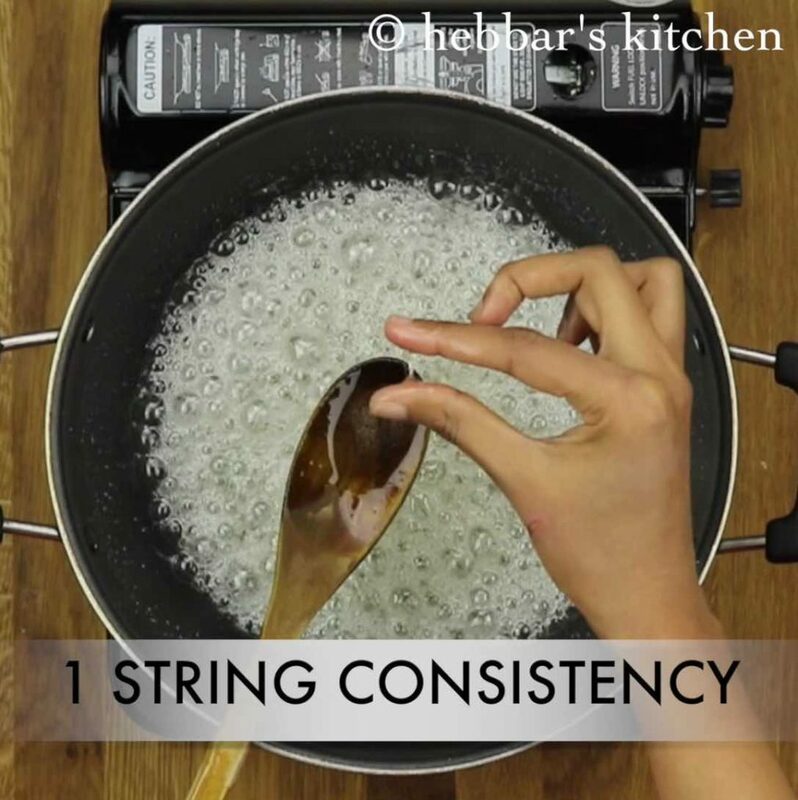 firstly, sugar syrup consistency or one string consistency is very important for this recipe. otherwise, mysore pak would turn to mysore burfi recipe. 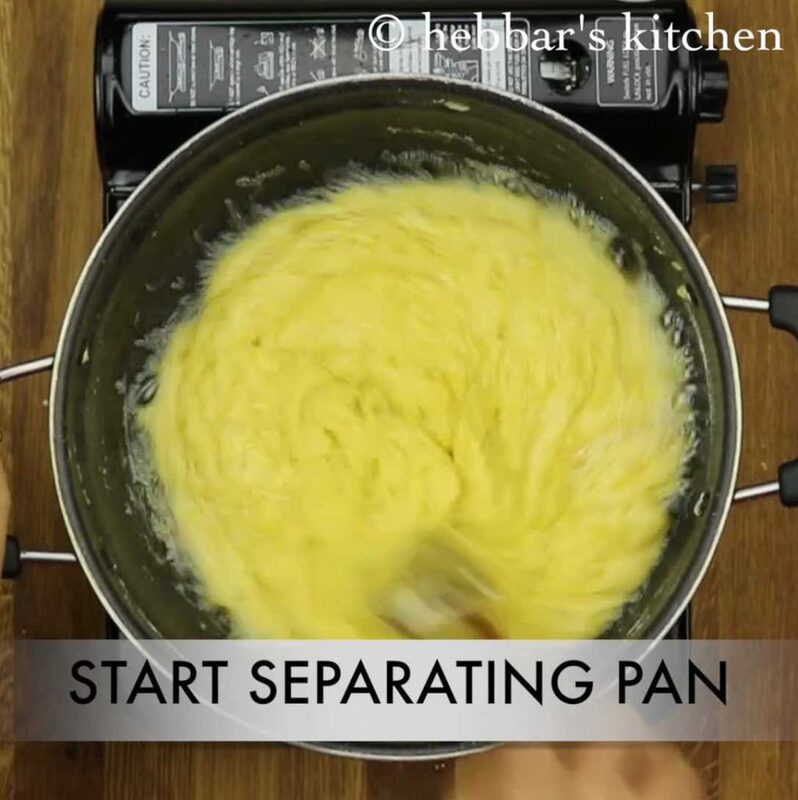 secondly, do not hesitate to add hot ghee + oil mixture to the surface of besan mixture. 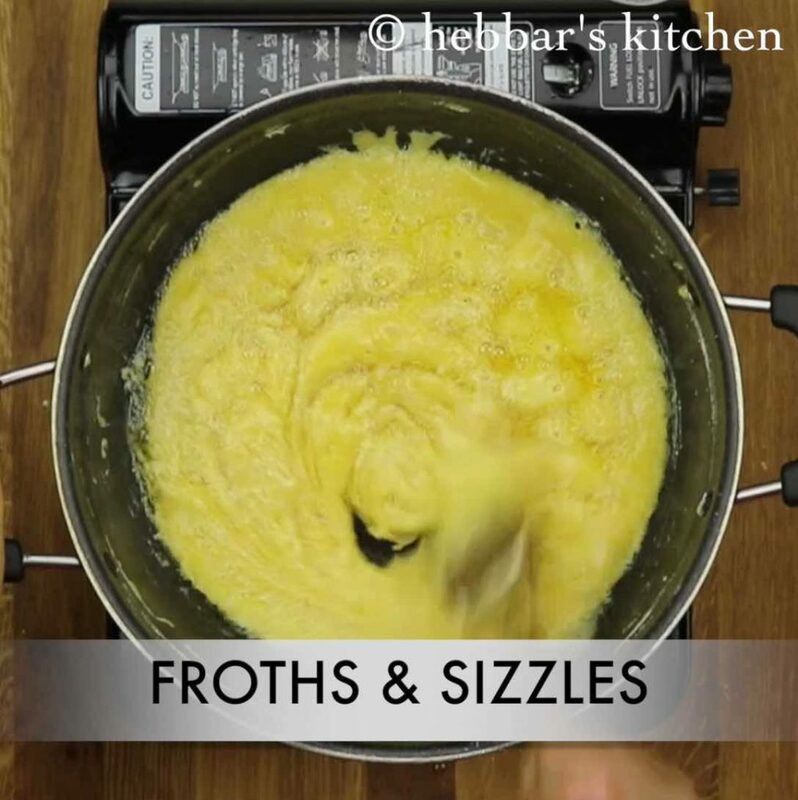 you should see frothy layers when adding hot ghee and oil mixture. thirdly, use a tray full of mysore pak so that you get enough depth for red colour in the middle of mysore pak. 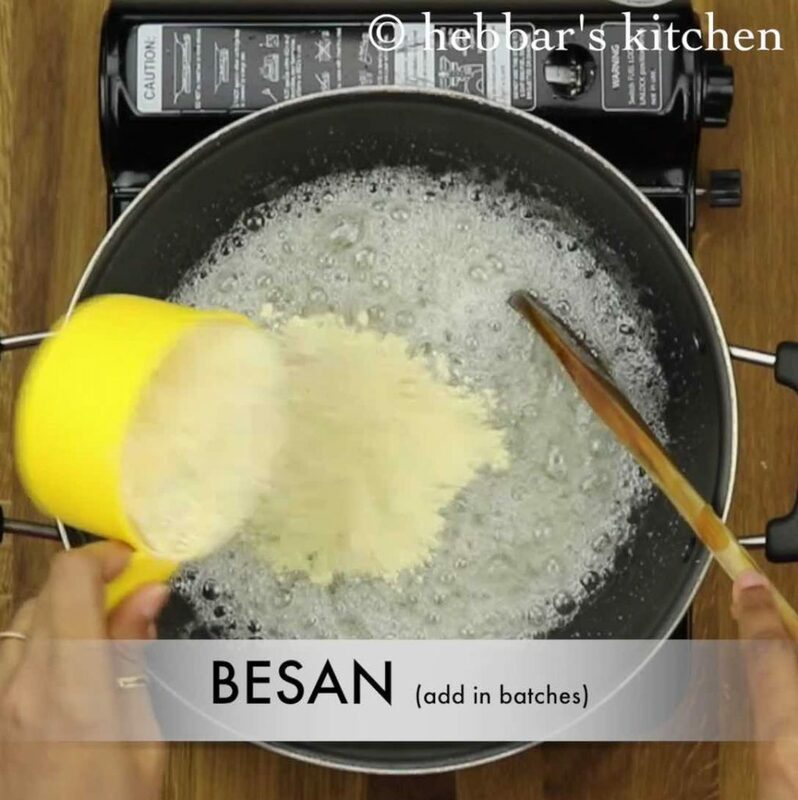 lastly, it is that 30 seconds where besan mixture starts releasing the oil and does not absorb more oil. also the mixture turns completely frothy and pours. without any delay, transfer it to a deep tray and let it cook in it. firstly, in a large kadai add ghee and oil. further get to a boil and simmer till you prepare mysore pak. firstly, in a large heavy bottomed / non stick kadai take sugar and water. get to a boil. 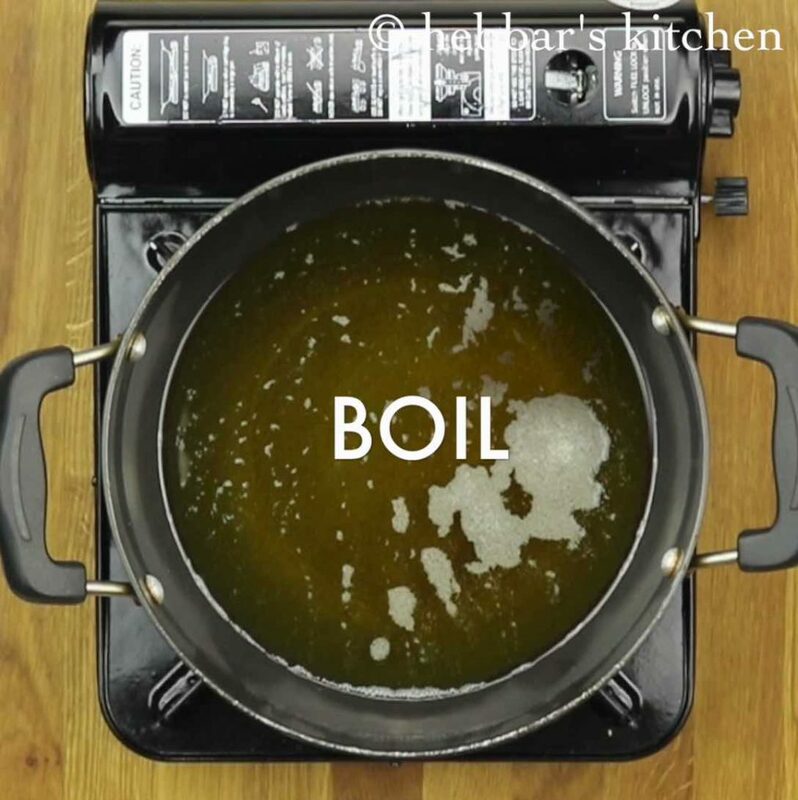 keep boiling and stirring till the sugar attains one string consistency. furthermore, keep the flame on very low and add sieved gram flour little by little. give a good stir making sure no lumps are formed. 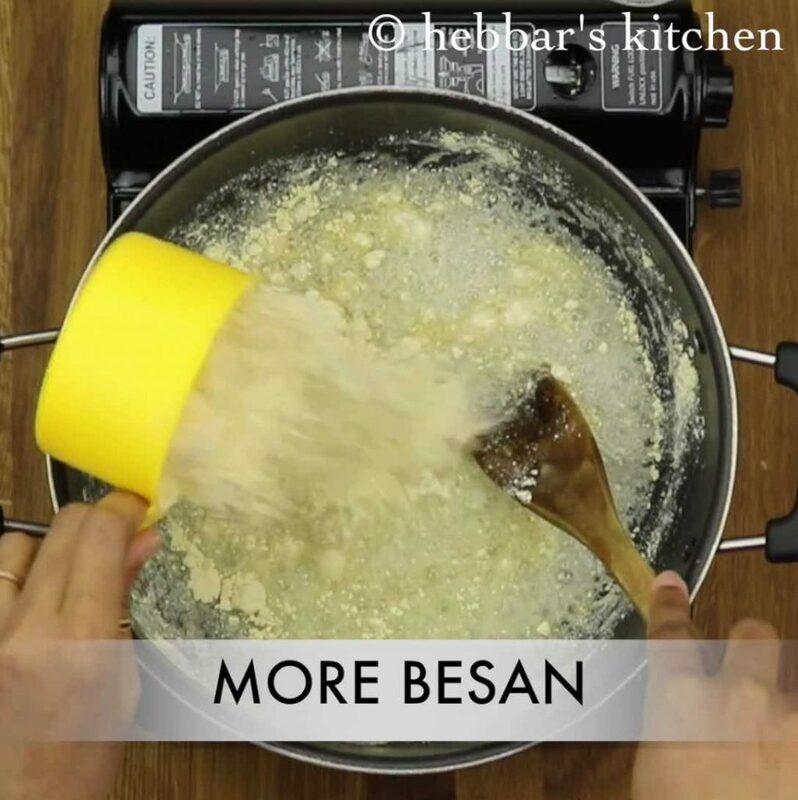 further add more besan and continue stirring. add approximately in 3-4 batches. 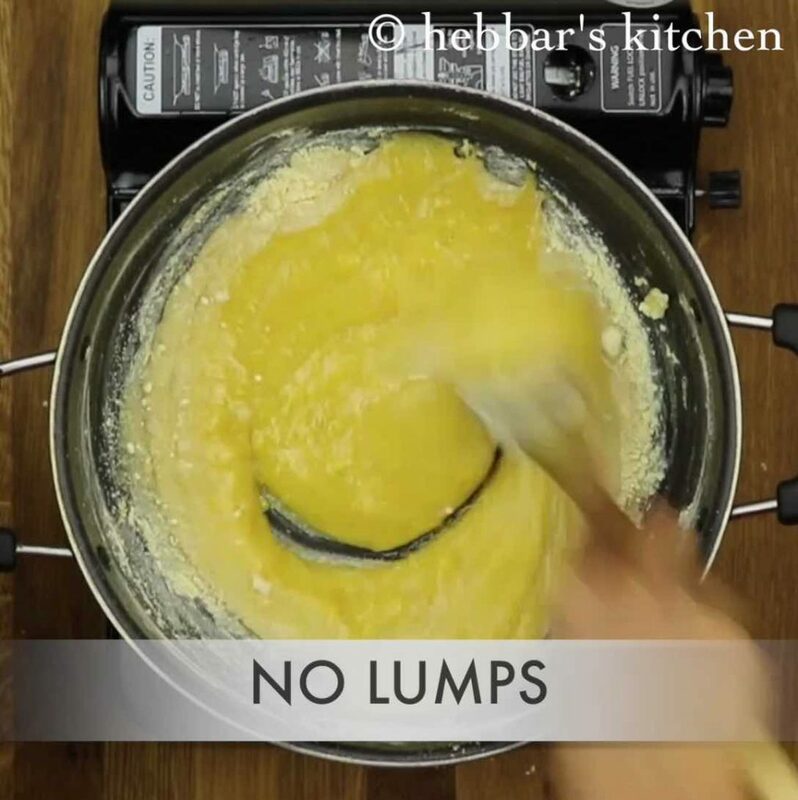 adding in batches and continuously stirring avoids from forming lumps. 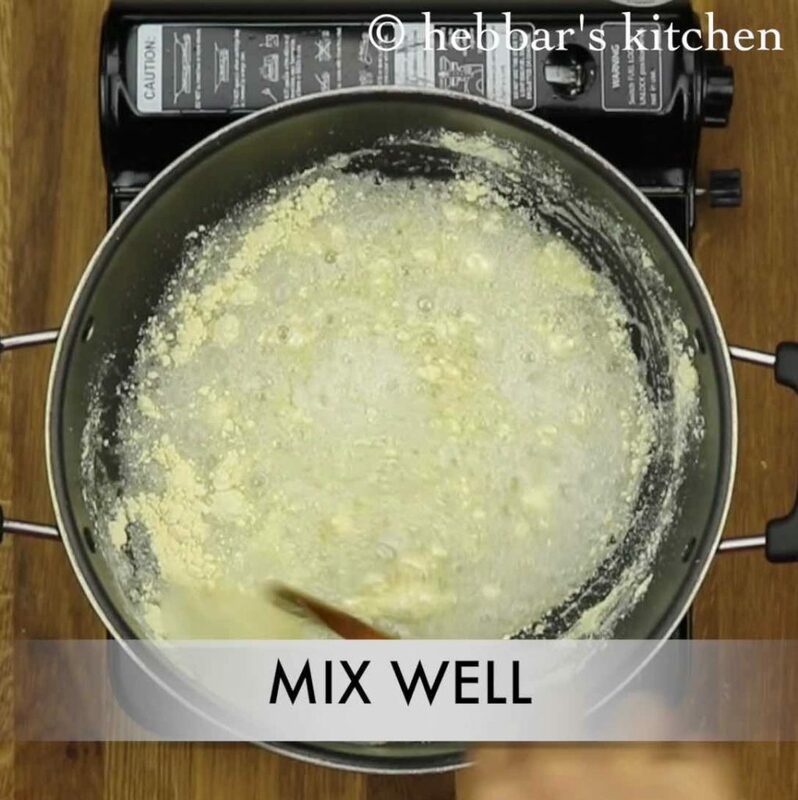 now take a ladleful of hot ghee-oil and pour over the besan mixture. 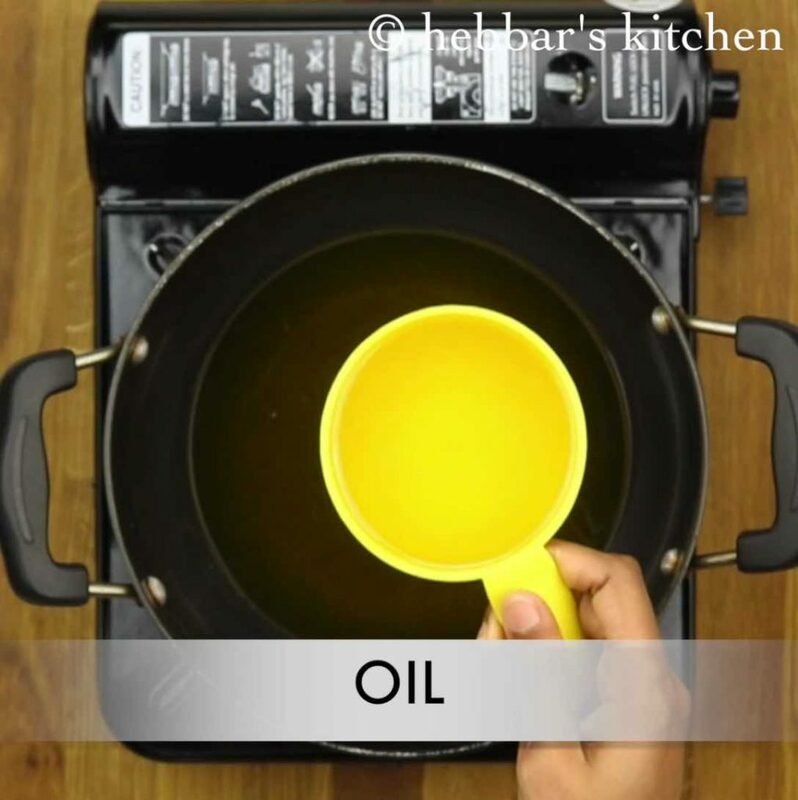 further,continuously stir till oil is absorbed completely. furthermore, add another ladleful of hot oil-ghee. sizzles and starts to froth at the top. keep continuously stirring till all the oil is absorbed. 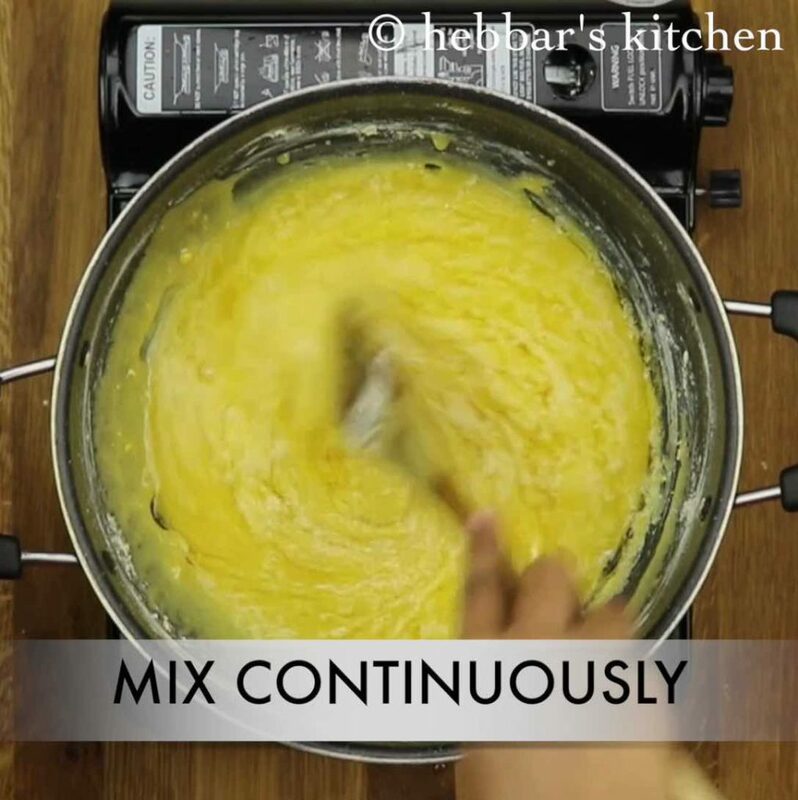 further, keep repeating 4-5 times till the mixture starts to separate from pan. and also the oil will start releasing from sides. no more the besan mixture will absorb oil. immediately, transfer the mixture to greased tray of enough depth. this helps to continue cooking and get golden brown colour in between. further, after 5 minutes cut into pieces as desired. after 30 minutes separate the pieces. finally, serve perfect taste and textured mysore pak. firstly, in a large kadai add 1 cup of ghee. ghee helps to give great taste. also and 1 cup of oil. oil helps to get great porous texture. 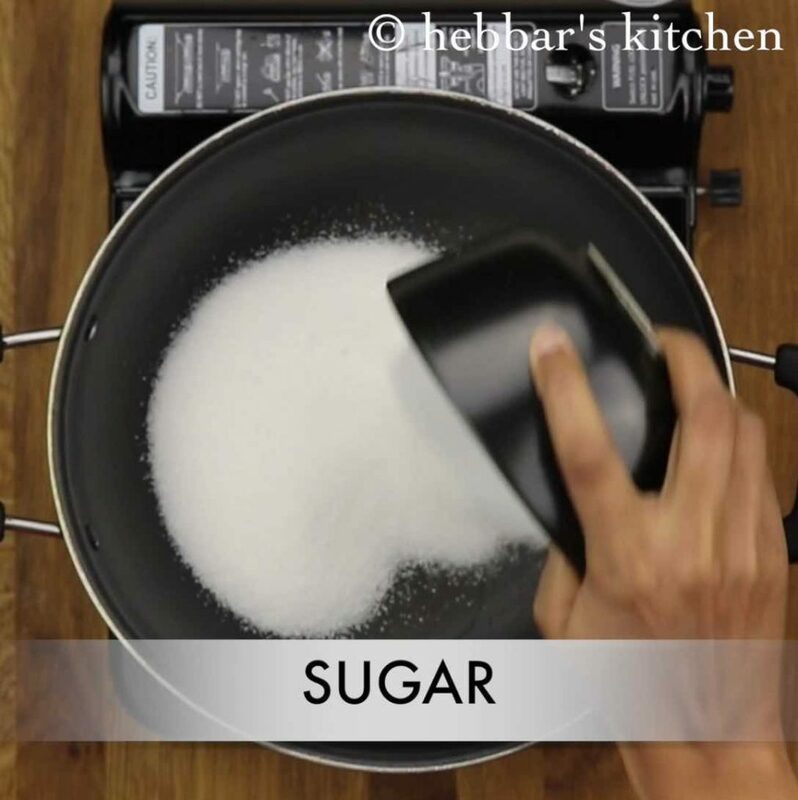 firstly, in a large heavy bottomed / non stick kadai take 2 cups of sugar. further add half cup of water and get to boil. 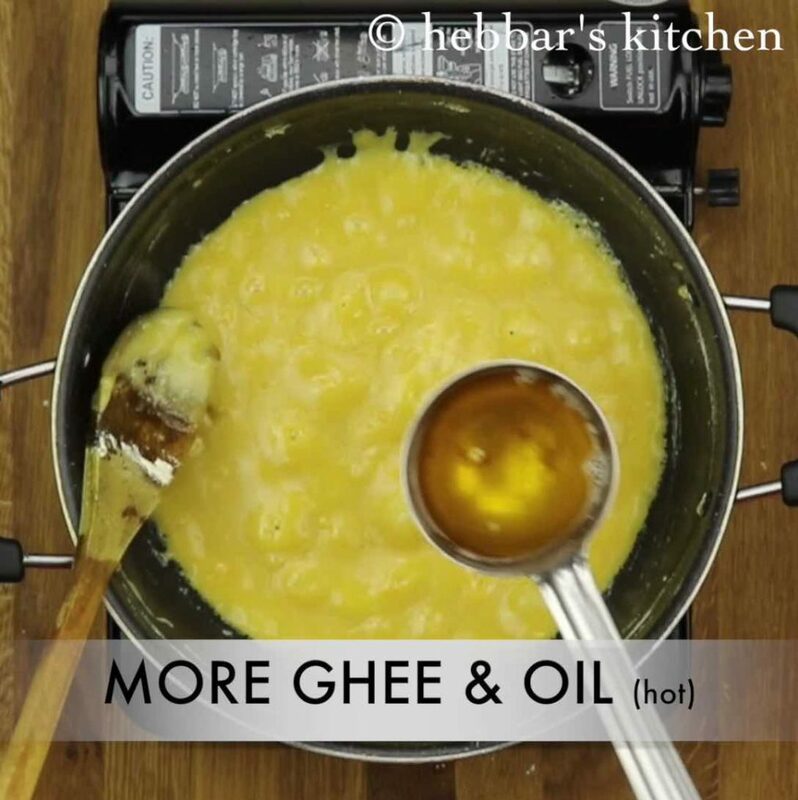 keep the flame on medium and take a ladleful of hot ghee-oil and pour over the besan mixture. 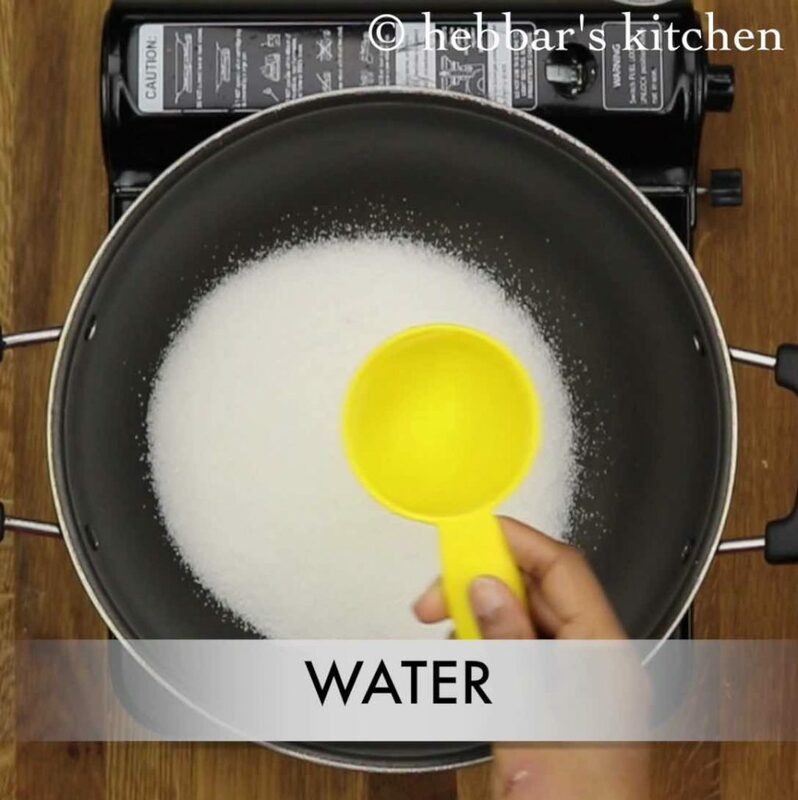 stir till oil is absorbed completely. and also the oil will start releasing from sides. no more the besan mixture will absorb oil. do not miss this fraction of second as you may end up with powdered mysore pak and will never hold shape else. also gently set with slightly pressing from back of spoon. after 30 minutes separate the pieces. do not disturb meanwhile. else you wont get the multicolour in mysore pak. finally, enjoy the diwali with perfect taste and textured mysore pak. 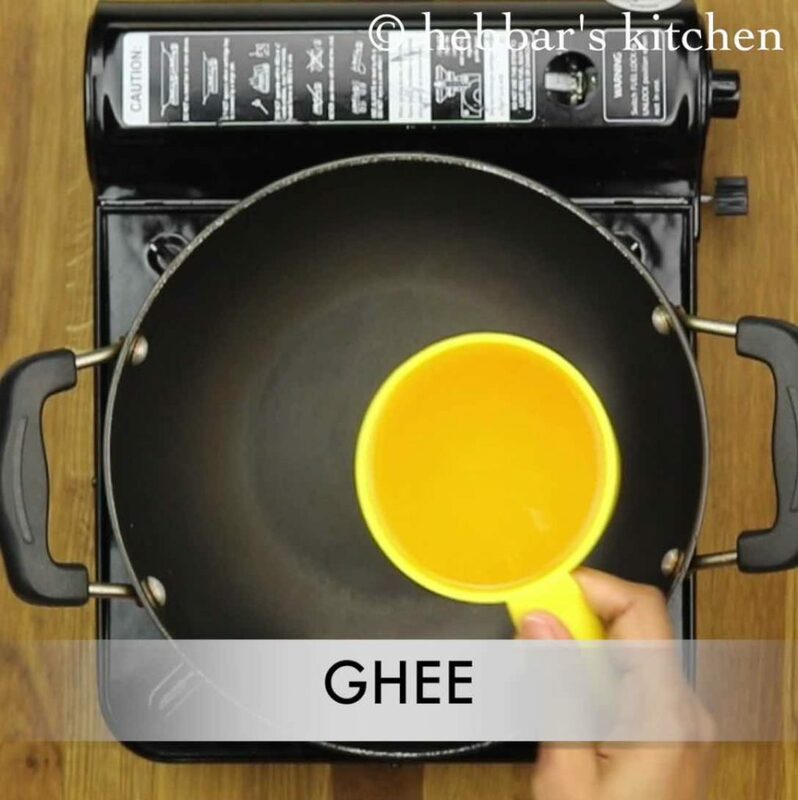 firstly, do not compromise in adding hot ghee and oil mixture. also sugar, ghee and besan proportion plays a crucial role. furthermore, do not get demotivated if you are not able to prepare in first attempt. 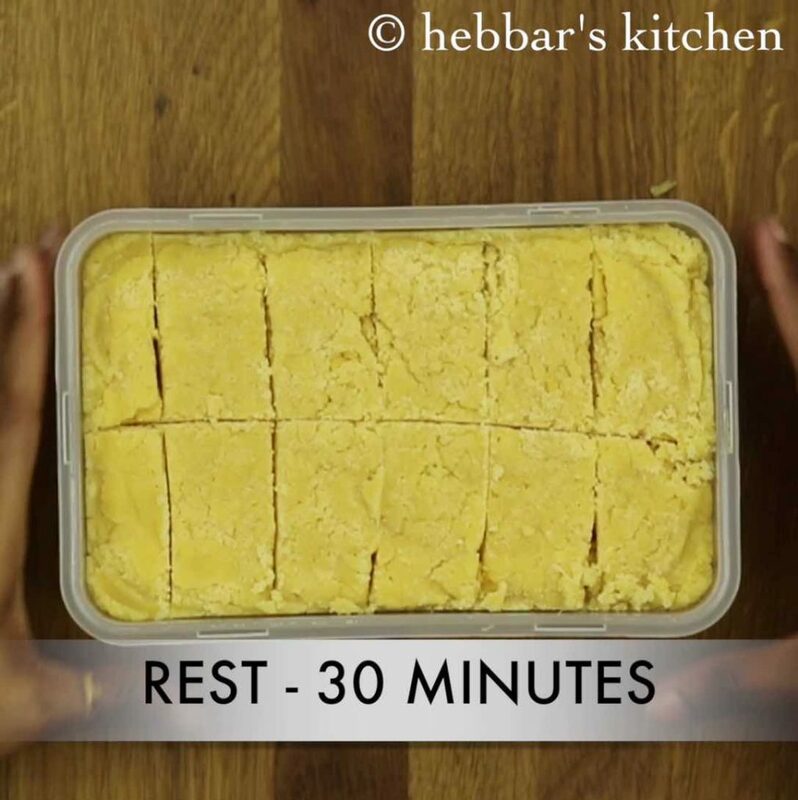 mysore pak is all about time management and experience. you will definitely learn from mistakes. additionally, using deep tray helps to get golden color in between. 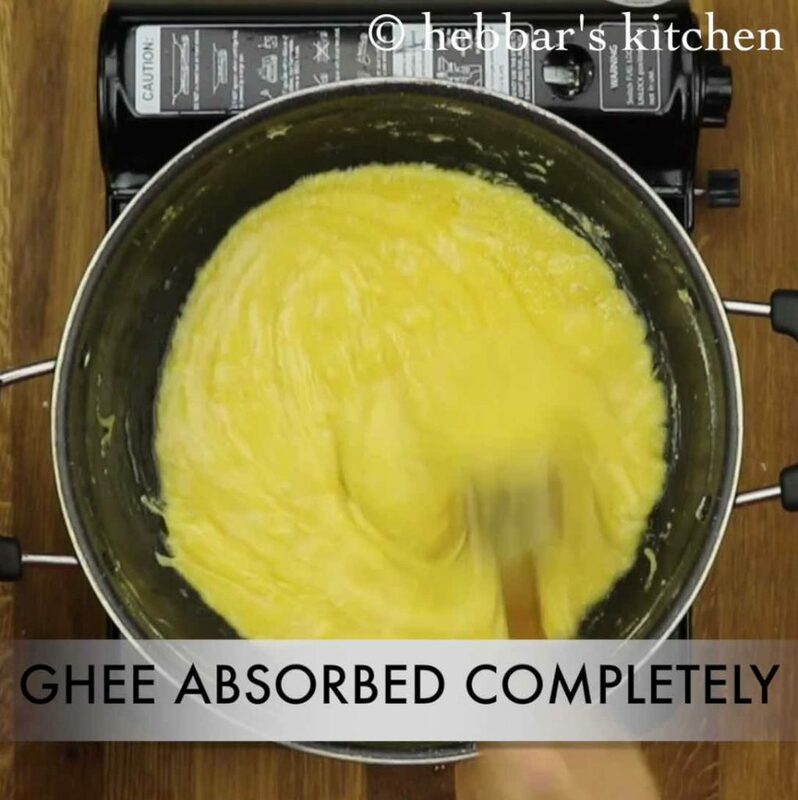 finally, do not add more ghee or mix once the ghee starts to release from the mixture. 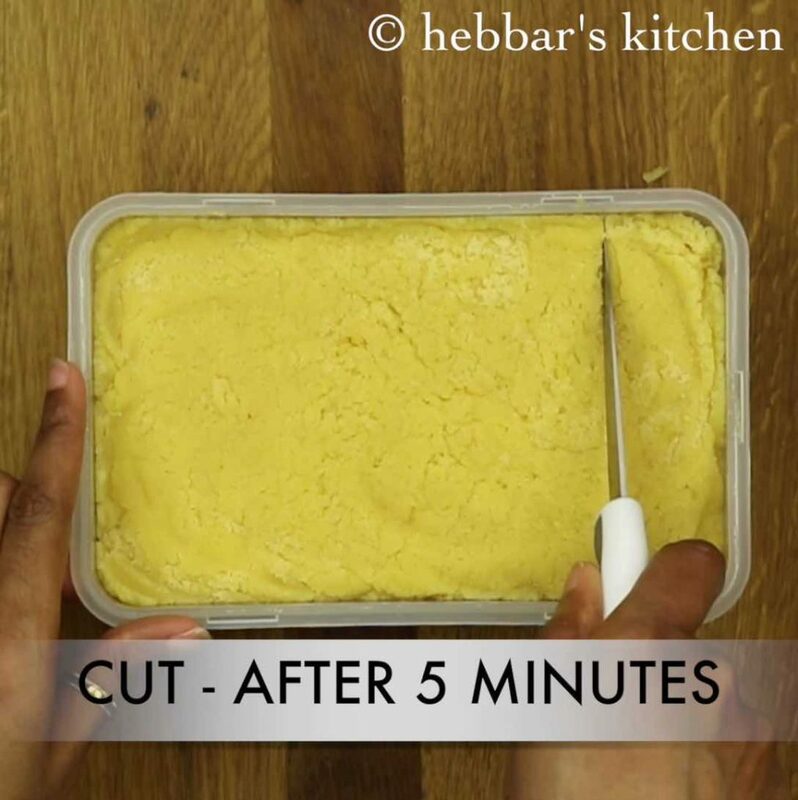 thats very important phase of preparation in mysore pak. hi what happened with me was while cooking and adding the ghee, it started to break into small pieces and the mixture was separating on its own…i was expecting the mixture to become sticky and remain as one ….but was surprised to see it is separating into powder…..i immediately transferred to the plate…the pieces have come out…but very soft…. Love the recipies and the preparation method. Thanks a lot. Thank you for an amazing step by step pricedure. Mysore Pak came out really well following your method. Thanks a lot for the tips too.. 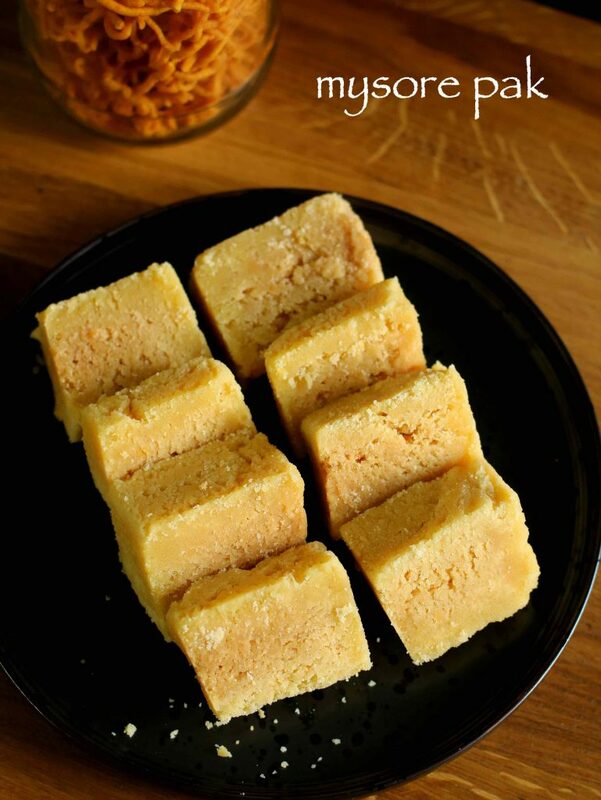 I used to always mess up with one string consistency in the sugar syrup but after seeing your videos, kaju katli and Mysore Pak is a huge hit in my house !! 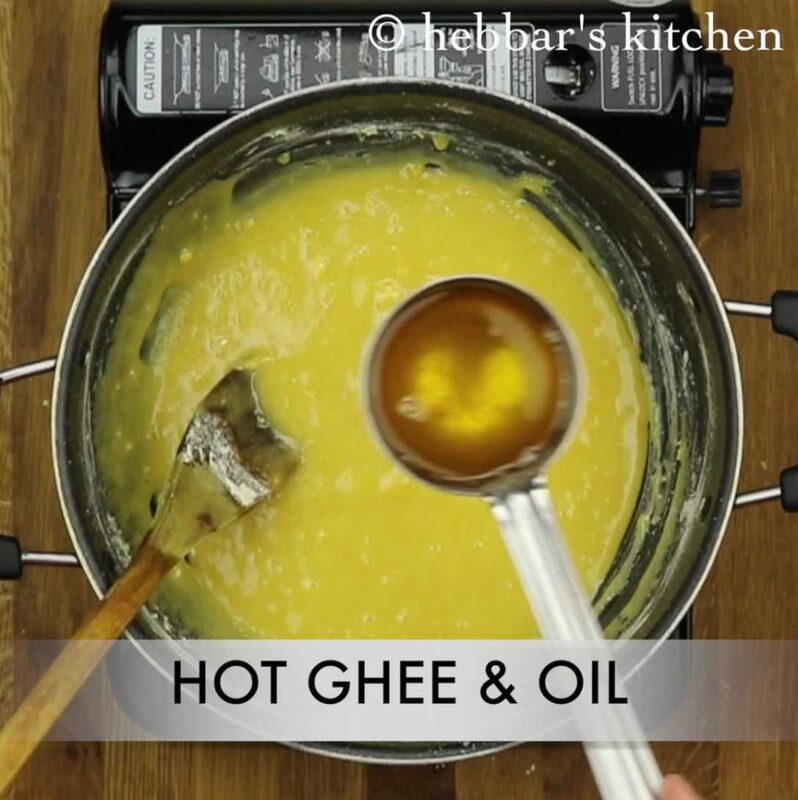 Can you please tell the temperature of ghee/oil. It’s really scary heating that. Oil and ghee should reach the boiling stage..
Great recipie but disappointed to see pouring hot Mysore Pak into a plastic container. Hi. You’re so amazing… Every recipe I try, it turns out well. Thank you so much for your step wise photos, it really helps to get the right consistency and to know exactly when to turn off from the heat. I got the Mysore pak in my second attempt and I am so happy..And after watching your videos, I feel that recipes are easy to do and anyone can do it. And I decide and do it. And it all comes together. I’ve tried your capsicum rice, Chole and Bature, garlic bread, mug cake, dum aloo, instant rava idili, instant dosa, tomato chutney and all chutneys and every recipe was awsome. Thank you so much. Keep inspiring. Hi Archana, this is the first recipe i made with your help and it has turned out amazingly gorgeous. i am not a great cook, but i love to try out. i did not know what is a one thread sugar consistency until an hour ago and today i learnt it. Thanks to you. The mysore pak is ready, my family has to taste it to tell how it is, but just from looks i feel it would be awesome. i am so happy for you and glad that you tried mysore pak recipe. do try more and more recipe. I like all your videos and your Mohanthal recipe came out excellent when I tried last week. All my friends loved it. The Mysore Pak came out perfect in your video. Instead if patting it with the ladel you should tap the dish itself. Again I can’t make it successfully, but have watched my Mother, Grand Mother, and Aunts make it while growing up. The consistency is the same but patting it makes the dough packed up tight and the layers are not visible. 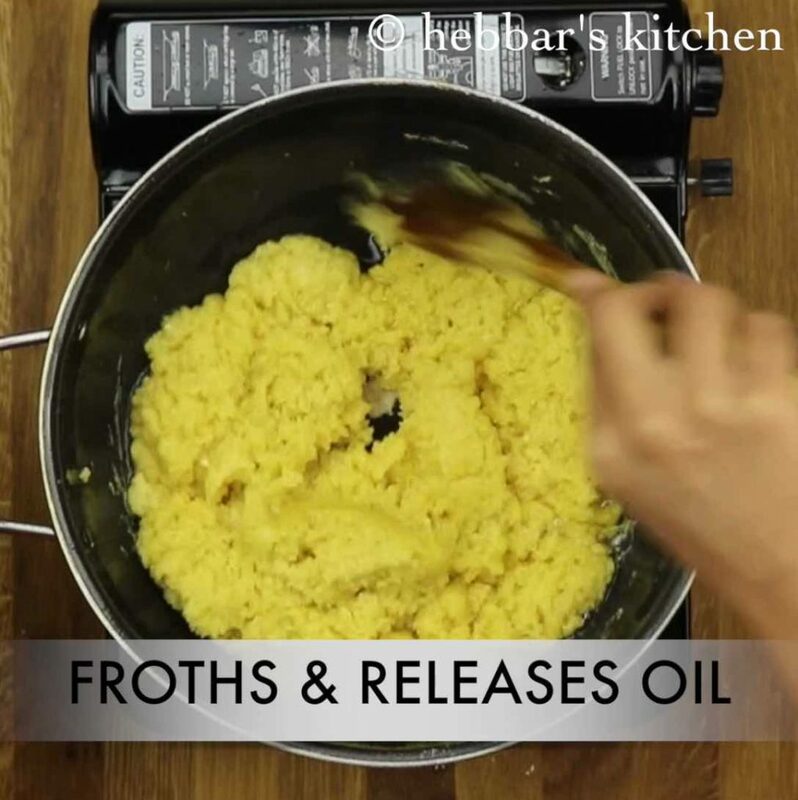 Can we just use ghee and not oil?? gas low rkhna h ya medium?? First of all, thanks for all the lovely recipes you got…. I tried the Mysore Pak…And it turned out so delicious and perfect….. It was really fun stirring all the time and Waiting to separate the oil…. My husband’s favourite sweet…. Happy that I can make at home. Ondele paaka maadidre sihi khaadya gatti aaitu.. enu maadidre sooktha? neevu nimbe hanninna rasa hakidriya? adu gatti madonna tadivutte. Which oil should be used. you need to store in fridge… it stays good but wont taste that great..
any cooking oil should do. you can also use coconut oil. I tried your mysore pak receipe just now. Unfortunately it has some raw flavor. Can you please suggest how to rectify that ? you need to add hot oil-ghee mixture in uniform interval.. and also continuously mix on medium flame till the oil starts leaving from sides. else the besan will be raw as its undercooked..